I keep thinking about that picture - I cannot get it out of my mind. I think - no, I know - that it is the most moving, the most eloquent, the most profoundly pathetic picture I have ever seen. It wrings the heart to look at it, it is so desolate, so grieved. It realizes San Francisco to us as words have not done & cannot do. I wonder how many women can look upon it & keep back their tears - or how many unhardened men, for that matter? “The Spirit of Humanity” depicted a woman taking a child into her arms, while at her knees another woman knelt. It was sold on May 6th for $250, to New York art dealer William Clausen. 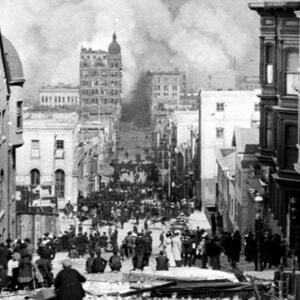 Twain loved San Francisco, where he had lived at the start of his career - and his immortal quip, that "the coldest winter I ever spent was a summer in San Francisco," forever associated him with that city. Autograph Letter Signed (“Mark”), 2 pages, octavo, on black-bordered mourning stationery, 21 Fifth Avenue, [New York City], April 30 . To Robert Reid.